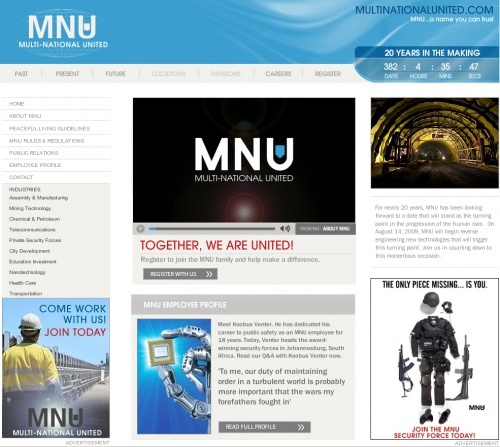 MultiNationalUnited is the website of a company based out of Johannesburg, South Africa that employs Non-Humans. Various company information and regulations can be found on this site in both English and Non-Human Languages. This is the main page and includes a video "About MNU" and a countdown to August 14th, 2009, which is believed to be the release date of the movie. For nearly 20 years, MNU has been looking forward to a date that will stand as the turning point in the progression of the human race. On August 14, 2009, MNU will begin reverse engineering new technologies that will trigger this turning point. Join us in counting down to this momentous occasion. Multi-National United, leading the world into the 21st century. Multi-National United is the global leader in technology adaptation and integration. For decades, we've put space age technology into the hands of men and women all across the world. From our introduction of lasting solar power technologies to the 14 million computers we donated to schools in South Africa in 2007, from our vast environmental management programs to the little things that join our lives together, at MNU we strive to turn our scientific discoveries into life-improving services for humans throughout the world. We are Multi-National United, creating a bright future for all mankind. This link is not yet active. A summary of guidelines to be followed to allow for a peaceful coexistence of Humans and Non-Humans. Johannesburg has found itself in the face of much adversity. In the midst of changes to the make-up of the world's population, we're continually challenged. MNU wants you to feel secure in cohabitation. Living in peaceful co-existence is a necessary and wonderful step to a bright future. MNU has worked closely with local government bodies to create reasonable rules and regulations to facilitate the interaction of non-humans in a human world. Now we urge you to look beyond the rules to find new ways to live together peacefully with other species. These guidelines aren't mandatory, but they will help the two populations work in a mutually functioning and beneficial way. By looking to these and respecting these ideals, we will find ourselves positioned for success. The responsibility for coexisting starts at home. Staying inside of your designated residential region will help keep order intact. Territorial integrity helps individuals feel safe, secure and empowered. When encountering unfamiliar scenarios, it's normal to react with aggression instead of reason. Always steer away from violence, as it will also endanger those around you. Know that the MNU forces are always available to help you avoid aggressive encounters. Familiarize yourself with your local MNU substation location. These officials are here to mediate. We are all socially obligated to follow MNU personnels instructions. Remember, they're there for everyone's protection. If humans encounter foreign materials or technology, such as nests of eggs or extraterrestrial fuel cells, please contact an MNU officer for help. Likewise for non-humans: If you find yourself in unfamiliar territory and are unable to manipulate human object with your tendrils, its okay to contact MNU personnel for assistance. Notifying the proper authorities promotes saftey for all: both humans and non-humans. Just as important as any other guideline for co-existing, it's key for non-humans to respect human internal affairs. Interference could trigger unneeded conflict that would disrupt the social norms that hold our society together. Non-humans can log community or political feedback at any MNU substation at the appropriate times. Keep these laws and guidelines in mind, and each day we can work together to maintain a human and non-human population that keep the great spirit of Johannesburg alive. What's your job at MNU? VENTER: I oversee all privatized security forces for MNU, with special focus on Johannesburg. Keep the civility and order is always our primary objective. To do that, well, you have to hold tight to protocol and make sure everyone's in line with the bylaws. How long have you been with MNU? VENTER: It's been a little more than 18 years. I come from a long line of military men, so I felt right at home taking a job in privatized security. To me our duty of maintaining order in a turbulent world is probably more important that the wars my forefathers fought in. What are your main operations in Johannesburg? VENTER: Foremost, we focus on the containment and management of District 9. We've been able to institute a stable structure there, much better than when I first began. The better we do at enforcing that structure, the better the surrounding areas are protected and safe. That's when we know we've done our job. Are changes in the horizon in Johannesburg? VENTER: Maintaining order is a fluid thing. Of course, new and different issues arise all the time and are dealt with accordingly. That said, we are beginning a concerted effort to eliminate trespassing. Many humans there site this as a primary concern, and we're listening. Non-humans have proven that they cannot operate by simply being made aware of the rules, so we're going to help them out a little bit. Just like any organized system, sometimes there are going to be growing pains. We're certainly not looking toward using it, but if brute force is necessary, it's necessary. What have you learned by working at MNU? VENTER: Being out in the field, you learn quickly how important it is to be able to react swiftly and contain any threat or possible threat as soon as it's eminent. Too many operations get caught up in bureaucracy and decisions get muddled because the decision-makers in the field have their hands tied while paper work gets pushed in some office somewhere. Any time a threat is ignored, it is sure to escalate. MNU has fine-tuned the system, and we're able to act and protect. KOOBUS VENTER just finished the end of his 18th year with MNU and was awarded his fourth medal of achievement in March of 2008. None of these links are active yet. A timeline of MNU's history. 08-05-1965 - Austin Henderson opens Henderson Manufacturing in Joplin, Missouri. 01-23-1981 - Henderson Manufacturing opens its first overseas plant. 06-15-1982 - Henderson Manufacturing becomes Multi-National United. 04-14-1989 - The Non-Humans land in South Africa. MNU medical staff is the first to respond, providing support for Johannesburg. 08-14-1989 - MNU is awarded the research, development and law enforcement rights in Johannesburg, South Africa. 12-05-1992 - MNU stock reaches $150 per share. 03-30-2002 - Dirk Michaels is appointed President and CEO of MNU by Board of Directors. 05-17-2003 - MNU stock reaches $400 per share. A summary of MNU's current projects. A summary of MNU's Future Milestones. MNU Job listings for both Humans and Non-Humans. Translate Non-Human text to English at the upper right of the listing. With offices in more than 100 countries around the world, MNU has a perfect job for you! We are currently expanding our operations in Johannesburg, South Africa. If you live in South Africa or are willing to relocate, please contact us about these current job openings. Description: Leader needed for expansion of global business developments. The perfect applicant must understand the intricacies of emerging technology markets and see the big picture. Description: On-point, highly organized, self-starter needed to manage executive office. Qualifications: Must have up-beat attitude, 5 years experience in executive assistance, multi-tasking abilities. Description: Manager needed to devlop new marketing strategies for non-humans. Will also develop strategy to promote retail sales across multiple media platforms. Description: Specialist needed to for tactical employee management and high-volume recruiting. Qualifications: Four-year degree required, plus a minimum of three years of experience in field. Description: Born leader needed to drive operations efforts in emerging global markets. Qualifications: 10+ years experience and proven ability to manage required. Description: Facilities maintenance and cleaning needed in series of MNU substations. Qualifications: Must have clean arrest record and proper work permits. Must purchase own cleaning supplies. Previous janitorial work experience preferred. Description: Position open for experienced miner. Qualifications: Must have clean arrest record and proper work permits. Applicant must be able to purchase own safety equipment. Description: Opening for grounds maintenance specialist to remove trash from several abandon lots in northern District 9. Qualifications: Must have clean arrest record and proper work permits. Must have prior trash-pick up experience. A 404 error screen on MNU.com that tells of the MFOS program has ended. Age can be found here. This page was last modified 13:00, 13 February 2009. This page has been accessed 79,686 times.